ESPN’s Jim Bowden, the former general manager of the Cincinnati Reds and Washington Nationals, recently wrote a two-part post listing each major league club’s “missing link.” Part I covered the National League, Part II the American and Bowden includes Padres-related material in each. First, he suggests the Friars “missing link” is a left-handed reliever and proposes they trade for Brett Cecil of the Toronto Blue Jays. Subsequently, when writing about the White Sox, he lists catcher-of-the-future as that team’s “missing link,” and recommends Chicago pursue Yasmani Grandal of the Padres to fill the need. A couple of issues/questions I have with this: One, I hesitate to say the Friars have done an “excellent job” in balancing the lineup. They acquired lefty-hitting OF Seth Smith and that’s it. Smith is a decent hitter and represents an upgrade over either Mark Kotsay or Alexi Amarista in that role but won’t strike fear in any opponent. Plus any hope the Padres have of fielding a solid lineup is still going to have to start with improvement from Chase Headley and healthy seasons from Carlos Quentin, Cameron Maybin and Yonder Alonso; all of which are far from sure things. Let’s just say I am far from sold that this group is going to constitute a quality offensive lineup. Second, we have no idea if Toronto would seriously consider moving Cecil and if they did what they would want back in a trade. Bowman neglects to specifically talk about that aside from a generalization made about the quality of the Friars farm system. It’s easy to say Team A needs this and should go get Player X but without knowing the potential asking price that type of proposition comes across as a bit presumptuous. “White Sox GM Rick Hahn has done a wonderful job in landing long-term solutions in right field (Avisail Garcia), center field (Adam Eaton), first base (Jose Abreu) and third base (Matt Davidson) since July. He could finish the job now by landing a catcher of the future. I love, love, love the upside and potential of Austin Hedges. But I’m not sure how having him makes Grandal expendable right now. MLB.com lists his MLB ETA as 2015 and that’s probably meant to say he is on track to be called up at some point in 2015; not necessarily that he will be in position to take over the starting duties behind the plate. He did reach Double-A last season but had all of 67 AB’s and recorded an OPS of just .566. He’ll likely start this season with San Antonio and could make it to Triple-A sometime during the 2014 campaign. 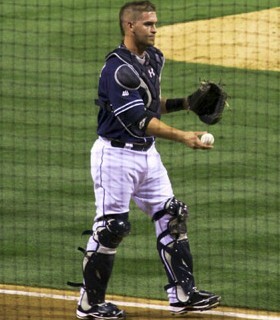 Trading Grandal now creates a vacancy this season that Hedges won’t be filling. Sure, Nick Hundley is still around and so is Rene Rivera, who filled in while Grandal was out last year, but is either of those guys a starter on a playoff team? The Padres fancy themselves as a club that can compete if things go right (see, good health for a multitude of players and a productive season from Headley) so wouldn’t they want to field the best possible tandem behind the dish? To me that would be Grandal and Hundley, not Hundley and Rivera. Additionally, coming off torn knee ligaments and a PED suspension, how can you describe Grandal’s market value as anything but low? Selling off an asset when their value is at its lowest point is not an example of good management. Under these conditions what could the Friars expect to get from Chicago? A B prospect? Um, no thank you, I’ll hang onto Grandal for now. It might make great sense from the Chicago perspective but dealing Grandal to the White Sox for what would probably be a ho-hum return is not a good idea for the Friars. Now don’t get me wrong, unlike many I actually like Bowman and enjoy reading his posts. He has twice been in charge of a major league front office and that isn’t something that I or anyone reading this is ever going to be able to say. He knows baseball and is respected in major league circles far more than I am. That being said I still felt the need to question his logic here. Life-long baseball and Padres fan who attended his first Friar games way back in 1983. I've been a contributor on Friarhood for more than two years and enjoy talking baseball with the knowledgeable fans that frequent the site. Prior to my beginning here I owned and operated my own San Diego sports site while writing for several other sites focusing specifically on hockey. When not watching, reading or writing about sports I might be sleeping or perhaps spending time with my family since I have few other hobbies. I did recently try my hand at golf and am a pretty good pool player to boot. You have to consider that Bowden is now a writer, not a GM, and he has a minimum number of pieces to produce and deadlines to meet. Leaving out details for an expansive overview, and creating reader interest/controversy is also part of the job description. I tend to gloss over these kinds of “suggestion” articles and pay more attention when the article is an analysis of individual players.